Hello again, and Welcome back to LilacsNDreams! I just love it when people share their ideas, show pictures of what they have done, and knowing how we can do some of these projects inexpensively too. Ever have one of those moments when you see something, and think "Who Would Have Thought?" Don't worry, it happens to me quite often. Above you will see a picture of bottles that are used for decor with the bathroom. 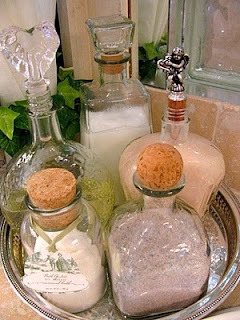 Use some lotions in them, sweet smelling bath salts or bath oils, and so on. Now, the bottles you see above are liquor bottles that have been cleaned out, and decorated for this purpose. Neat idea, huh? You know it doesn't always have to be the liquor bottles either. If you find other bottles at home that have some of the distinctive shaping for this purpose it is great to use them too. Clean the bottles out good, maybe add a printed label to decorate it, add some burlap string tied into a bow, and you get the picture. I found this picture at Pinterest, and it showed there that this came from Sublime-Decor.com. Sometimes these bottles are great to show on your dressers, vanities, on the counter in the kitchen filled with kitchen accents, put a couple of them on a shelf, maybe a mantel, and so many possibilities when you repurpose and upcycle different pieces. I hope everyone had a wonderful weekend, and that you enjoyed your visit with LilacsNDreams today. Hope I was able to give you some more ideas to either do with your own home decor, or maybe give someone a gift for theirs too. Thanks for sharing your time with Me today, and hope to see you again soon. Take care, and have a great Monday everyone!